Customers can cancel their reservation free of charge up to 2 days before arrival (local time). 1).Check in time after 13 hrs and Check out time is before 11:00 noon. 2).Cash payment only upon arrival. 3).Customers can cancel their reservation free of charge up to 2 days before arrival (local time).4) Smoking is not allowed inside the rooms.5). If guests want to book onward journey through taxi or bus or train, you can take Vinayak's assistance for best options. 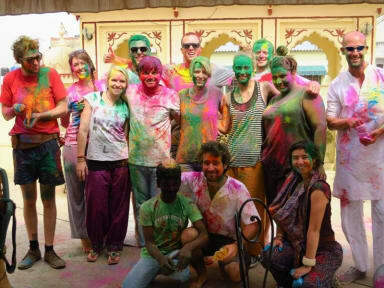 Vinayak Guesthouse provides a warm,friendly environment for travelers visiting Jaipur . It is run by a small family who are friendly, trustworthy and eager to help their guests.We have a homely and safe atmosphere in an Indian style budget guesthouse, with delicious home -cooked Indian specialties.We provide a comfortable environment where travelers can relax after a day of sight seeing in the bustling Pink City. Mixed dorms have majorly evolved, my friends. As well as AC, think privacy curtains, your own fan, personal charging socket and reading light. If Dorms are not your thing, prepare yourself for the rise of the privates! In this hostel nu-age, you can stay in hotel-quality rooms for microscopic prices, with the added bonus of the social vibes that a hostel offers. Private rooms, en-suites and balconies are pioneering the hostel revolution! All bathrooms come with hot/cold showers. Balconies and cable TV are available in some rooms and all rooms have locks, so your things are secured. Internet with WI-FI is available in all rooms and dorms, as well as the rooftop restaurant. Same day laundry for an additional fee, plus rooftop terrace for relaxing and eating. If you arrive early , we can safely store your luggage free of charge in our luggage storage until the time you check -in. we can also store luggage free of charge after you check out and are ready to leave. A valid photo ID (only passport & visa) is required from all guest and regardless of nationality - otherwise we are not able to check you in and you will still be charged for the amount equal to your first night stay. - Jaipur train station is within 10 mins walk and the central bus station is 10 - 15 mins by tuk tuk ride. - The old city gate is 2 kms east and attractions are 3 kms east . Amber fort is roughly 14 kms away and we advise you either take bus or a taxi/tuk -tuk. -Restaurants ,cafes and bars are located on MI road which is within 15 mins. walk. -Atms and stores selling essential items are 2 -3 mins walk. Very welcoming and lovely people. They helped us in everything we needed. 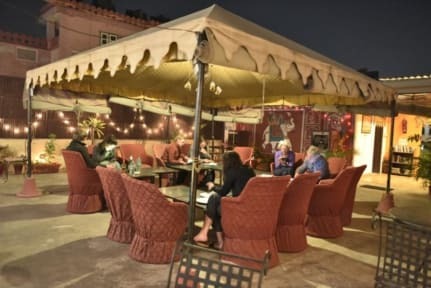 Place is fantastic, the rooftop is cozy and an amazing place for chilling out after a long day in Jaipur. Very close to the train station. Totally recommend. Buena ubicación, zona tranquila. Camas con sábanas y duvets Buena limpieza Buena comida y a precio accesible Único problema.. A la hora de ducharse se inundaba el baño.. El agua no drenaba. Pero lo recomiendo, es uno de los mejores que he estado. El personal muy agradable.. Buena familia. Really nice place. Clean, nice stuff, awesome rooftop to relax, good food. Everything was nice. 100% recommended. Was just amazing. The rooms were we slept were really nice. The staff were so nice, always kind and helping with everything. The breakfast/beers at the rooftop just perfect. Good place even for long stay , nice food and the room was perfect . Uno de los mejores sitios donde hemos comido en India! Terraza fantastica para relajarte y tomar algo. Hermosa familia. Nos atendieron realmente muy bien. Y tiene una hermosa terraza para tomar o comer algo tranquilo. Llegamos en bus muy temprano por la mañana y pudimos acceder a la habitación a las 7 am aprox. Gracias por todo. Muy buena relación calidad-precio. We stayed for two nights in a double ensuite, it is quite close from the train station.